Long known as an industrial center, Perm is trying to reinvent itself as a cultural capital. Will the plan work? The city of Perm, located in the Urals foothills, is, geographically speaking, the most easterly city in Europe. Yekaterinburg, which is situated further to the east, beyond the Urals ridge, is located in Asia. Yet, while the whole world thinks that Europe ends at Perm, its citizens are convinced that it begins there. Perm owes its birth to the mountains that separate Europe from Asia. One of the first copper-smelting works in the Urals was built there in the early 18th century. As production developed, the settlement grew and Empress Catherine II (the great) soon signed a decree creating the city of Perm around the plant. 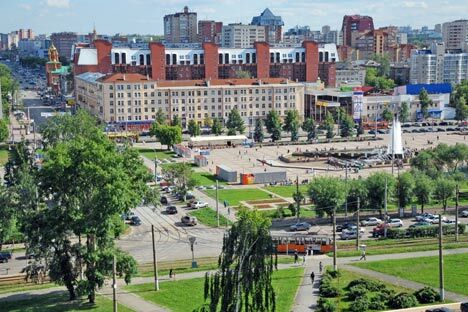 For centuries, the city developed as an industrial center, so it is not surprising that the working people in Perm welcomed the October Revolution of 1917. In 1940, the city was renamed Molotov, but not for long, as its former name was restored in the late 1950s. Today Perm is a leader of Russian heavy industry. In recent years, however, the city has been striving to rid itself of its image as Russia’s industrial capital and be recognized as a cultural capital. Can a mighty industrial city, studded with factories, turn overnight into a capital of fashion shows, music and modern arts? The local people are confident that they can do it; the local museum features ancient local artifacts such as wooden idols and bronze animal medallions alongside modern art. Artists and musicians come to Perm to lecture and give master classes and, once every two years, the city hosts the Diaghilev Seasons, a classical festival in memory of the famous ballet impresario Sergei Diaghilev. This is not accidental – the guiding spirit of the famous Russian Seasons in Paris lived in Perm with his family for a long time and graduated from the local school. This year, the city had its first ever White Nights multicultural festival, which lasted a whole month. The authorities hoped the festival would attract hundreds of thousands of tourists but in reality there were fewer. This was partly due to poor promotion of the festival events and partly to the lack of a convenient tourist infrastructure, including information centers, cheap hotels, bicycle rentals and even toilets. Even so, Perm is persevering. Like other major Russian cities, last June Perm opened a pedestrian street, its answer to Moscow’s Arbat. At present, it looks somewhat wild and provincial: a patchy asphalt surface, street vendors with nothing to do, a couple of artisans and a children’s playground. Yet the pedestrian street is already included in the standard sightseeing tour that winds around the center. The tour, called The Green Line, links key historical sights of old Perm such as merchants’ houses, churches and monuments. Not surprisingly, it also includes museums, such as the Perm Museum of Local Lore housed in a sumptuous villa that used to belong to the arts patron Nikolai Meshkov. This imposing building, with its columns and stucco moldings, overlooks the Kama River. Its storerooms and exhibition halls contain all the treasures of the city’s many centuries of history. A little back from the riverbank, the Museum of Perm Antiquities features a vast paleontology collection: skeletons of the ancient lizards that gave their name to one of the Palaeozoic periods and the legendary Perm mammoth. An alternative tourist route, called The Red Line, was inaugurated more recently. The places of the greatest romantic dramas played out in the city are marked in red on the city map. Works of art and stone monuments are not the city’s only attractions. Because of its unusual history and geographical position, Perm has produced many remarkable personalities, some of whom became legends in their own lifetime. Take Alexei Bessonov, a well-known local communist, an active blogger and an irrepressible public campaigner. He jogs in the morning and, thanks to his robust health, is ever ready to fight for the ideals of the Communist Party. He has come up with some startling initiatives. For example, he proposed turning the city hall into a pretrial detention centre and he tried to organize guerilla units to oppose the cultural reforms. Bessonov’s activities are hailed by the local media, and he has long been a living legend in the city. You can see him all over the place: In the morning he often jogs through the city’s main streets and, at noon, he can be seen leading a demonstration and carrying a banner in front of government buildings. Another local celebrity is Alexander Zhunev, a street artist who holds degrees in economics and geology. When he painted his first graffiti in 2008, he realized this was what he had been born to do. Now people come from afar to look at his works. If you see a portrait of the poet Sergei Yesenin that is as tall as 10-storey building, or Spongebob Squarepants atop an electrical transformer box, or public phones in the shape of a fish or a cat’s head, you can be sure Alexander Zhunev has been here with his spray paint. And it is a good idea to visit the places that he has visited. In contrast, Mikhail Shmakov has disliked Perm from the time he was a child. He thought the city was drab and gloomy. To escape the drabness, Shmakov and his wife set out on a voyage around the world. They have already crossed Africa and South America. Having seen half the world, Shmakov now admits that he does not want to leave his home city for good. The “wilderness” surrounds the city in the shape of thick forests and the deep, dark waters of the Kama, a major river that slashes right through the middle of Perm. Today, though, the city is divided not only by water. One part dreams of turning it into a cultural capital and the other part wants it to be an industrial city, as of old. How to keep both camps happy? Perm is in the midst of stormy processes that will certainly be interesting to watch.